What Are The Health Benefits Of Eating Spicy Foods? Hot and spicy foods cause a burning sensation in the stomach on consumption, but this is just to allow the individual to build tolerance level, to allow the intake of more spicy foods. Many mistakenly believe that taking spicy foods can cause stomach problems and that it plays a role in worsening stomach ulcers. But, there are plenty of reasons why spicy food may be good for you. To enjoy the health benefits of eating spicy foods, one may consume them in smaller amounts and increase the ‘spiciness intensity’ as required, as soon as the body gets used to it. And the truth is that spicy foods help in protecting the stomach lining. Hot and spicy foods cause a burning sensation in the stomach on consumption, but this is just to allow the individual to build tolerance level, to allow the intake of more spicy foods. This is one of the best benefits offered by spicy foods. Spicy foods enhance the metabolic level of the body and thus help keep control of the weight. A study by Laval University noted that consumption of red pepper can increase the metabolism rate and cause the body to burn more energy in a quick and effective manner. Also, a red pepper eases out the hunger pangs and is a very good option, if one is keen on losing weight. Spicy foods can help improve the heart function. The chemical capsaicin, an active component of chili peppers which produces a heat sensation in the tongue, has shown to lower the bad cholesterol levels. A study published by the American Chemical Society mentions that capsaicin helps lower cholesterol and increases blood flow by blocking a gene that causes the narrowing of arteries. Spicy foods like curry contain a pigment known as curcumin that has antioxidant as well as anti-cancer properties. A study led by the England’s Nottingham University showed that curry has cancer-fighting properties, and curcumin is specifically helpful in fighting and preventing prostate cancer. The study also quoted that prostate cancer is rare in India, where people consume curry on a regular basis. 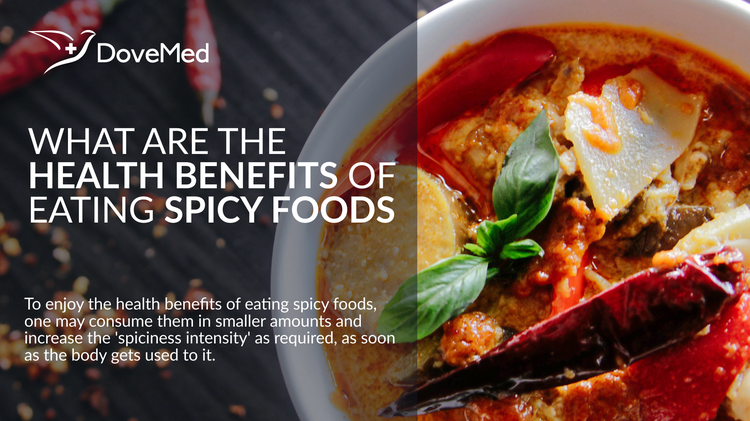 Consuming spicy foods can help relieve the nasal passage as they provide more heat to the body, and ease out sinus congestion and relieve clogged nasal passages. It is also effective in fighting respiratory problems, like chronic bronchitis and asthma, and helps relieve flu-like symptoms including fever. The capsaicin in spicy foods can increase nitric oxide quantity in the bloodstream. This helps protect the body against inflammation and lowers the blood pressure. Cayenne pepper is one such component of spicy food that lowers blood pressure quickly. The heat from the spicy foods aids the brain to release endorphins. This helps the body fight pain from heat and can help improve the mood as well. When consumed in moderation, spicy foods can help relieve the human body of a lot of chronic ailments and diseases. Do not miss out on trying some spicy food the next time! Gerstel, J., More, B. M., Schwartz, R., Cravit, C. R., Burford-Mason, A., Devine, D., ... & Bendall, L. Eating Spicy Foods May Help You Live Longer. Costello, C. Can eating spicy foods help you lose weight?. Lv, J., Qi, L., Yu, C., Yang, L., Guo, Y., Chen, Y., ... & Tang, Z. (2015). Consumption of spicy foods and total and cause specific mortality: population based cohort study. Bmj, 351, h3942. Forouhi, N. G. (2015). Consumption of hot spicy foods and mortality—is chilli good for your health?.